Tourist art production is a global phenomenon and is increasingly recognized as an important and authentic expression of indigenous visual traditions. These thoughtful, engaging essays provide a comparative perspective on the history, character, and impact of tourist art in colonized societies in three areas of the world: Africa, Oceania, and North America. Ranging broadly historically and geographically, Unpacking Culture is the first collection to bring together substantial case studies on this topic from around the world. Ruth B. Phillips is Director of the Museum of Anthropology and Professor of Art History and Anthropology at the University of British Columbia. She is the author of Representing Women: Sande Masquerade of the Mende of Sierra Leone (1990) and Trading Identities: Native Art and the Souvenir in Northeastern North America, 1700-1900 (1998). Christopher B. Steiner is Lucy C. McDannel '22 Associate Professor of Art History and Director of Museum Studies at Connecticut College. 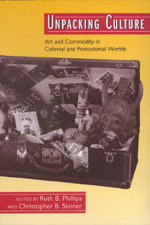 He is the author of African Art in Transit (1994) and coeditor of Perspectives on Africa: A Reader in Culture, History, and Representation (1997).